Dallas Bishop Edward Burns delivers catechesis at World Youth Day for English-speaking pilgrims. The Australian contingent of World Youth Day Panama pilgrims has been urged to follow the example of the Apostles, to not leave the Church because of Judas and to keep their focus on Jesus. The hundreds of young Australians have been participating in catechesis sessions along with other English speakers, with similar sessions held in more than two dozen languages. From the Greek word meaning to “echo” or “resound”, catechesis is an act of echoing the Church’s teachings to the world. Each morning of World Youth Day, catechesis sessions, involving reflection, reconciliation and recreation activities, help prepare pilgrims for the major events of the week. 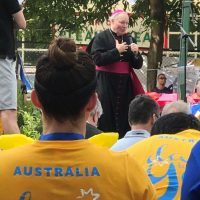 Dallas Bishop Edward Burns, who led one of yesterday’s sessions, spoke on the theme “Here I am” to a 2000-strong group of pilgrims from Australia, New Zealand, the United States, England, South Africa and other English-speaking countries. A number of Australian priests, including Sydney Archbishop Anthony Fisher OP and Parramatta Bishop Vincent Long van Nguyen OFM Conv, concelebrated with Bishop Burns, who in his homily said people should “never fail to see Christ in others”. Yesterday afternoon, pilgrims explored the Youth Festival, which included the “Follow Me” Vocations Fair, Exposition of the Blessed Sacrament, the “Renew Me” Garden of Forgiveness and musical presentations. Josh Low, 28, from the Archdiocese of Perth, is attending his fourth WYD. This year, he’s working as one of the estimated 2500 journalists accredited to cover the event. “There’s definitely an air of excitement in the city, especially with the arrival of the Holy Father,” he said on Thursday morning. “You can feel that it’s a joyous celebration here. As at every World Youth Day, you see young people full of life and eager to learn about the faith, share their experiences and glorify God. There are people walking through the streets chanting and singing and it almost feels life-giving. This entry was posted in Uncategorized on January 25, 2019 by ACBC Communications.